The 32nd-seeded ’84-’85 Winnipeg Jets have earned a reputation of being a force offensively and therefore a difficult team to beat. However, the top-seeded ’76-’77 Montreal Canadiens completely dominated the Peg and held them to just nine goals over four games and only 25.8 shots on goal per game. Everybody knows the second half of the 1970’s belonged to the Montreal Canadiens. They had a ridiculous number of future Hall of Famers on those teams. So, be prepared, again, for some names. 10 different players scored for the Habs during the sweep and Steve Shutt led the way with seven. Four of Shutt’s goals came in a 10-4 Habs win in Game 3. Yvan Cournoyer was second behind Shutt with six. The top two in assists for Montreal turned out to be defensemen. Larry Robinson tallied 10 assists while Guy Lapointe was second with eight. At the top of the overall scoring leaderboard for Montreal, Lapointe and Shutt were tied with 11 points each. Robinson was alone in second with 10 points, all of which were assists, obvi. Four more Canadiens averaged more than a point per game during the series, including Jacques Lemaire (eight points), Pete Mahovlich (seven points) and Guy Lafleur (six points). In goal, Ken Dryden didn’t have much to do at times. As I said earlier, the Jets only averaged 25.8 shots on goal per game. He wasn’t great, though, in this series. He posted a 4-0-0 record with a 2.25 goals against average, but a not nearly that impressive save percentage of .913. However, he did start of this series by stopping about the first 40 shots he saw in this series as he didn’t allow a goal until less than two minutes left in regulation in Game 2. Six different players accounted for the ’84-’85 Jets’ goals in this series. Three of the nine came from Brian Mullen, a team-high, while Doug Smail with his two goals was the only other player to score more than once for Winnipeg. Meanwhile seven different players registered an assist for the Jets. Dale Hawerchuk tallied five helpers during the series to lead the team while Paul MacLean was second with three. Defensemen Dave Babych and Dave Ellett were the only other players to have more than one assist with two helpers each. Hawerchuk and MacLean were also first and second on the team in overall scoring with six and four points, respectively. The goaltenders for Winnipeg were completely overwhelmed. Brian Hayward started all four games, but he was pulled three times during the series for backup Marc Behrend. Hayward took all four losses in the series to go along with a 5.00 goals against average and a .867 save percentage. During his time on ice, Behrend faired even worse as he allowed nine goals on 55 shots for a dismal .836 save percentage. 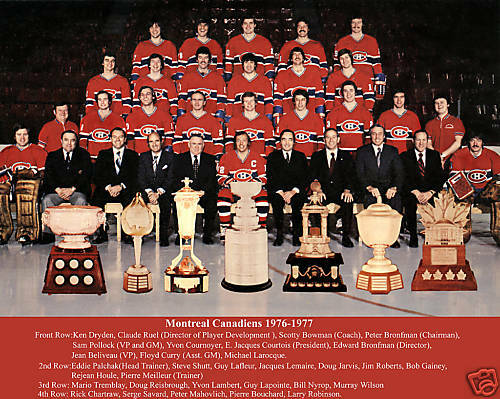 In their second Ultimate NHL Playoff, the ’76-’77 Canadiens already have one UNP Championship under their belt. Of course, the Canadiens franchise has won both of the first two UNP’s. In the Third Round, they will face the 16th-seeded ’02-’03 Dallas Stars, who defeated the 17th-seeded ’88-’89 Calgary Flames in six games this round. The ’84-’85 Jets have represented Winnipeg’s original franchise in all three UNP’s. In the inaugural tourney, they were ousted in the First Round and last year, they were ousted in the Third Round. So, they have a track record of being all over the place. Up next in the Second Round, the 9th-seeded ’81-’82 New York Islanders face the 24th-seeded ’84-’85 Washington Capitals! This entry was posted in 2nd Round, Ultimate NHL Playoff and tagged Brian Hayward, Brian Mullen, Dale Hawerchuk, Dave Babych, Dave Ellett, Doug Smail, Guy Lafleur, Guy Lapointe, Jacques Lemaire, Ken Dryden, Larry Robinson, Marc Behrend, Montreal Canadiens, Paul MacLean, Pete Mahovlich, Second Round, Steve Shutt, Ultimate NHL Playoff, Winnipeg Jets, Yvan Cournoyer. Bookmark the permalink.